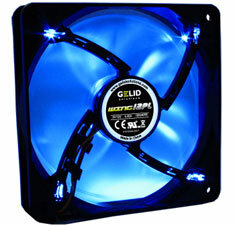 GELID Wing 12 PWM Blue LED. 600-1800RPM, up to 75.6CFM and noise levels as low as 10dBA. 4-Pin PWM fan connector. Backed by a 5 year warranty. The WING 12 PL features a unique Nanoflux bearing which ensures a friction-free and silent operation. Thanks to the clever design and magnetic bearing the impeller can be detached for an easy cleaning. Additionally fan blade winglets were designed to achieve larger airflow and greater static pressure. 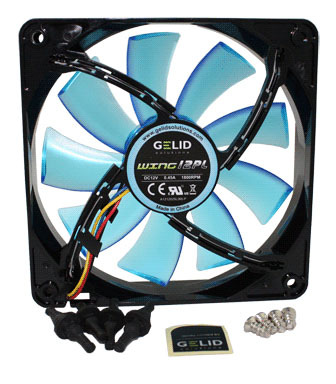 Thank to GELID's Nanoflux Bearing the impeller can be detached and the fan blades can be cleaned easily. Even though conventional sleeve and ball bearings currently dominate the fan market however both have their disadvantages. While sleeve bearings have very low noise emissions and are very cost effective, they tend to leak oil; once the oil has dissipated the fan can no longer operate. Ball bearings, on the other hand, while providing longer operating life are costlier, noisier and are prone to damage. GELID's Nanoflux bearing uses magnetic flux to limit contact and friction between the bearing and the shaft. High precision self-lubricated material eliminates oil leakage. The result is a ultra quiet long life bearing.